"Do not cry, my little Ochiba. You are safe now..."
"What is 'Ochiba?' My name is -!" "Hush, now, my little one. Your old name is gone, just as your old life is gone." "W-what do you mean?" A tiny, five-year old girl stared up into the face of the old gray wolf, unaware that she should not be able to understand the animal's words, nor the animal her's. The wolf, an elderly female, gazed down at the little girl, knowing that she was so much more than a human, and all of her instincts screamed at her to run far away from this anomaly of nature. But the poor child had no-one, fallen from the sky as if by a miracle. The elderly female knew that if she left the girl to herself, she would be dead within a single cycle of the Bright Circle. She would not let the death of a pup weigh on her conscience, not even if that pup was not that of a wolf. She nosed the little girl to her feet. "Come, my little one. I will take care of you now." "Gin, what does 'Ochiba' mean, anyway?" the girl asked the old wolf, following her to the river. "It means 'Fallen Leaves,' my little one," the wolf replied. "Then why do you call me that?" "Because you fell through the sky with a swirl of leaves, little one. You truly are of Fallen Leaves." "Gin! You can't die!" Ochiba sobbed, kneeling next to the elderly female. The wolf in question raised her head wearily. "Do not cry, my little Ochiba. It is the way of the Circle." The almost-teenaged girl sniffed. "What Circle?" "The great Circle of Life, of course. Each of us are born, and then we have children of our own, and then we pass on to the next life. It is the way of the world." "But, why, Gin? Why do you have to go now? I need you." "Listen to me, my Ochiba. You are strong, because I have taught you all that I could. I wish I could live longer for you, but I cannot. But listen," she interrupted the young girl. "There is something important I must tell you. In two full cycles of the seasons, there will come a night when you will feel an itch to run and howl and become one with the forest. You will change, and it will be frightening. But you must know..." the elderly female broke off, tremendous coughs wracking her frail body, sending ripples across her thin fur, revealing her ribs. "My little Ochiba, I am almost out of time. You must promise me... when that night comes, it is then that you must seek out your past. Follow the Bright Circle from where it rises every day, past the great human cities until you come to a city with the tallest tower. There you will find your past and your pack... so the legends say..." the elderly wolf coughed again, weakly, before falling into silence, breaths small and ragged. The girl sobbed over the body of her foster mother for two cycles of the Bright Circle before tearing herself away to find something to eat, knowing that Gin would not have wanted her to starve herself. Ochiba whined, rolling around in the dirt outside of her home cave, feeling an itch that she couldn't quite get to stop. She had long forgotten the message that Gin had given to her right before she died, lost in the many memories that she had of her foster mother. She couldn't bear to think much about Gin anymore, as it always caused great pain to her chest region. Ochiba looked up in the sky. The Bright Circle had set in the sky, and she could see the Night Circle just beginning to rise, bright and full. The sight of the full circle sent a bolt of first icy-hot, and then burning-cold through her. Then she threw back her head and screamed as pain lanced through her and her body changed. 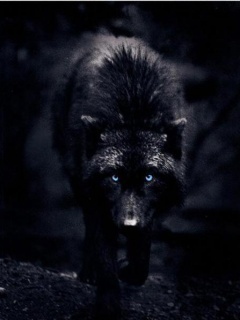 She writhed on the ground in pain, her scream turning into a low howl as she turned into a pitch-black wolf. After the change had finished, the pain left suddenly, leaving her panting on the ground, trying to make sense of what had happened. She lifted her head and sniffed, eyes widening as the world suddenly became clearer than a pond of fresh water. She got to her feet, and realized that she was not a normal-sized wolf; in fact, she was almost three fox-lengths tall and five fox-lengths long! Ochiba closed her eyes, feeling as if she belonged in the world for the first time since she could remember. It took Ochiba a year to remember what Gin had told her that night she had died. She realized that Gin had known what she was, though she didn’t quite understand how she was a hybrid of human and wolf. She had to know; she had to find out what and who she was. So she set out to find the truth. She found that ever since that night she had turned into a wolf, she was able to change into a wolf whenever she wanted, except the one night each month when the Night Circle was gone from the sky. That night and day she found that she was weaker than any other time, and she made sure to be safely hidden during that time, for she did not wish to join Gin on the other side just yet. Eventually, five years after she had first started out on her journey to finding the truth, she found the city that humans referred to as ‘New York,’ where she spied other creatures like her, able to take on both human and animal forms. She found that she was frightened and disgusted by the creatures able to change into cat-like forms especially, but drawn to the others like her that could change into wolves. She could smell that there were at least three distinctive packs of wolves that lived in and around the city, and she found herself drawn to the one that smelled darker and more like ice, rather than the ones that smelled of forest and the ones that smelled of fire and smoke. Perhaps this was where she was meant to be. Ochiba crept forward, ears perked, one facing forward and the other turned in the opposite direction, listening for any change in the environment. She breathed through her nose silently, taking in each scent and storing the information. She eyed her prey, an elderly doe that stumbled and tripped, lagging behind the herd a little ways. She had found that even with her greater strength and bigger body than the normal wolves, without a pack she was not able to hunt the stronger bucks or healthy, young does. She leaned forward, stalking the deer, getting closer and closer to the elderly animal, which was drinking from the river, unaware of the danger. Ochiba bared her teeth, feeling the soft rumble in her empty stomach, saliva gathering in her mouth at the thought of how long this doe could feed her. Finally she just couldn’t wait to creep forward any longer, and she burst from the undergrowth, leaping onto the flanks of the doe, claws unsheathed and fangs burrowing into its spine. The doe bucked, bleating and crying out in surprise and fear. The herd of deer broke into a run, leaving the crippled elder to fend for herself against the young, strong, and very hungry wereling. The doe bucked and kicked underneath her, but Ochiba did not let go, slicing her claws down its flanks, taking it to the ground with her superior weight. When it fell to the ground, Ochiba lunged for the jugular, biting down on its throat with all of her strength, causing blood to spurt into her mouth and slowly pool around the doe’s head. The doe gave a few more kicks before it gave up, falling back. Ochiba released her grip on its neck, and bent her head to stare into the doe’s eyes as it died, a low whine escaping her throat. Do you grant me permission? she seemed to ask. The doe looked at her and seemed to bob its head. Find me worthy of sustaining you… The light left the doe’s eyes, and for a single moment, starlight seemed to fill the black pupils before fading, leaving dull, coal-colored blank eyes. Ochiba hummed thoughtfully in the back of her throat for a moment before turning away from the doe’s head and tearing into its stomach, ravenous.